Prisoners taking part in a beauty contest pose before the start of the competition in the women's prison Centro de Orientacion Femenino (COF) in Fraijanes, some 40 km east of Guatemala City. The contest was held in the framework of the Inmates Day celebrations. The COF has a population of 135 inmates. Inmate Ingryd Paola poses for a picture of a beauty contest . 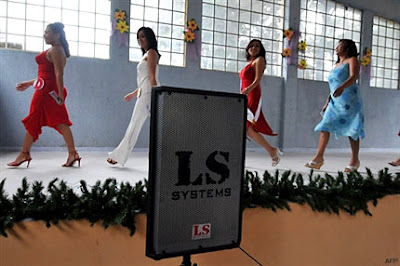 Inmates take the catwalk during a beauty contest. 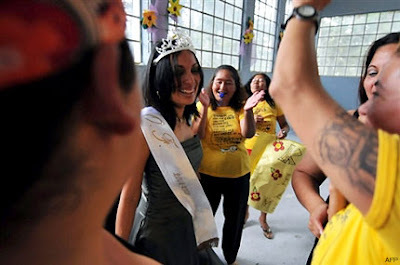 Prisoner Karen Espana parades during a beauty contest in the women's prison Centro de Orientacion Femenino . A prisoner is cheered by mates as she walks the catwalk during a beauty contest. Scottish prisoner Wendy Moncriezz looks at the camera pior to the start of a beauty contest. Inmate Karen Espana talks to a journalist after winning the beauty contest in the women's prison .